Negative and Positive Voltage Clamping Circuits – A clamping circuit, also known as a dc restorer, changes the dc voltage level of a waveform, but does not affect its shape Consider the clamping circuit shown in Fig. 3-33. When the square wave input is positive, diode D1 is forward biased, and voltage equals the diode forward voltage drop (VF). The peak-to-peak output voltage (Vo(PP)) is the difference between the positive output peak (VF) and negative output peak -(2E – VF). It is seen that the peak-to-peak amplitude of the output waveform from the clamping circuit is exactly the same as the peak-to-peak input. Instead of the waveform being symmetrical above and below ground, however, the output positive peak is clamped at a level of +VF. The circuit in Fig. 3-33 is known as a negative voltage clamping circuit, because the output waveform is almost completely negative. Reversing the polarity of the diode and capacitor in Fig. 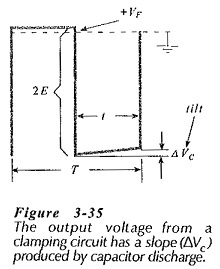 3-33 creates the positive voltage clamping circuit shown in Fig. 3­-34. As illustrated, the output waveform is clamped to keep it almost completely positive. Resistor R1 in Figs. 3-33 and 3-34 is sometimes termed a bleeder resistor. Its function is to gradually discharge the capacitor over several cycles of input waveform, so that it can be charged to a new voltage level if the input changes. However, R1 partially discharges the capacitor during the time that D1 is reverse biased, and this produces a slope, or tilt (ΔVc) on the output waveform, as illustrated in Fig. 3-35. When designing a clamping circuit, capacitor C1 is selected so that it becomes completely charged in approximately five cycles of the input waveform. As already discussed (and illustrated in Fig. 3-37), diode D1 is forward biased when C1 is being charged. When the pulse width and source resistance of the input waveform is known, C1 can be determined from Eq. 3-44. So long as the slope on the output waveform is very small, the capacitor discharge current is essentially a constant quantity. When the output waveform slope is specified, IC can be calculated from Eq. 3-43, and a suitable resistance for R1 is then determined by substituting IC into Eq. 3-45. The biased clamping circuit shown in Fig. 3-39 has a bias voltage (VB) at the cathode of diode D1. The peak-to-peak output voltage is the difference between the positive and negative output peak levels. It is seen that, as for other clamping circuits, the peak-to-peak output waveform from the biased damper is the same as the input. The positive level of the output is clamped to (VB + VF). 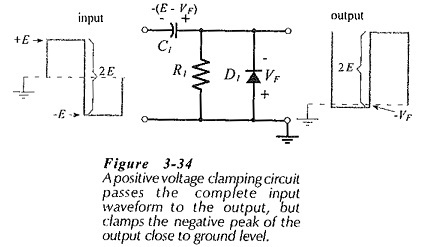 Virtually any bias voltage level (positive or negative) can be used with a biased clamping circuit. 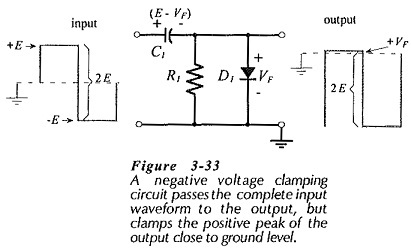 The diode polarity determines whether the positive or the negative peak of the output is clamped. 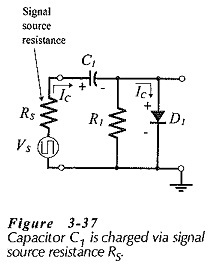 Care must be taken to ensure that the capacitor is connected with the correct polarity. 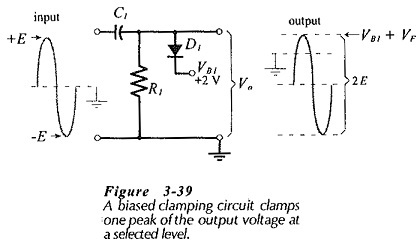 Biased clamping circuits are designed in exactly the same way as unbiased clamping circuits. Zener diode clamping circuits operate just like biased voltage dampers, with the Zener diode voltage (VZ) substituting for the bias voltage. The peak-to-peak output remains equal to the peak-to-peak input voltage (2E). 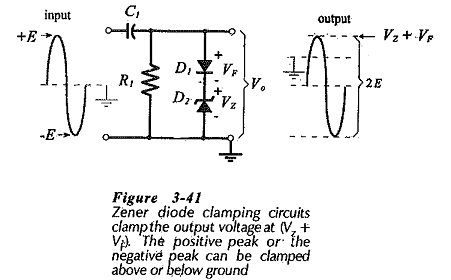 If the polarity of the diodes (and the capacitor) are reversed, the negative output peak is clamped at -(VZ + VF).